PRAISE FOR "PLUNDERING PARADISE "
"Stunning.... A journalist repudiates the usual Discovery Channel views of the remarkable islands and examines the lives of the many who call the Galapagos home.... The rotting underside of a lovely, fragile leaf." 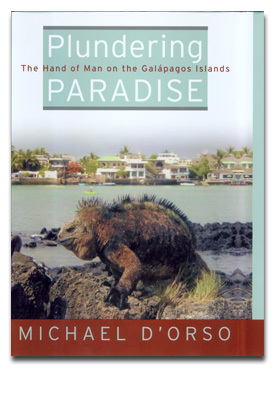 "With rich, witty prose as colorful as the characters he describes, D'Orso reveals the human side of the Galapagos.... This is a stellar study of the alchemy of man and nature." "Riveting....Outrageous....Exceptional....D'Orso takes the reader on an intimate tour of the revealing efforts and conflicts of ecowarriors and government officials, and into the lives of native people who now number in the thousands....This is an ongoing conflict unreported until now." "The genius of his book lies in his patient discussion of the forces responsible for the islands' decline.... D'Orso is so evenhanded that, by the time you're finished, you can forgive practically everyone, except maybe the smarmy developer of a Galapagos resort hotel complete with pillow mints and turndown service." "Captivating in both his lucidity and precision, D'Orso seamlessly blends island history, political reportage, ecological analysis, and vivid portraits of islanders as he traces the radical changes that are turning this once pristine natural paradise into a besieged and endangered ecological battleground." "An atmospheric and alarming story about the difficulty of sustaining Eden for biologists, told by a journalist who has taken the time to listen to many of the locals.... D'Orso is an unpretentious reader's representative as he travels from island to island, spotting human quirks alongside natural wonders." "D'Orso, by stripping the exotic trappings from this spectacular setting, may help a paradise from being lost." "Plundering Paradise is a tale of human biodiversity, simultaneously fascinating and alarming.... The question here isn't about survival of the fittest, but about survival, period." "D'Orso's casually powerful storytelling draws us into the grotesquely unequal struggle between a unique and fragile ecosystem and the humans bent on getting rich fast." "[A] frank appraisal of what man is wreaking in one of nature's most fragile laboratories." "A classic supply-and-demand story whose plot continues to thicken." "If even half of what D'Orso says is true, and his case seems very strong, the time for this Eden may be rapidly running out." "In this haunting narrative, journalist Michael D'Orso travels to all thirteen islands over a three-year period, spending time with their inhabitants, chronicling their rich history and their desolate modern-day existence.... His tale is by turns poignant and unsettling."